Tullis Rennie (2014). Socio-Sonic: An ethnographic methodology for electroacoustic composition. Organised Sound 19(2), pp. 117-124. Abstract: This paper outlines a way forward for an anthropologically inclined electroacoustic music. Considering the similarities in methodological approaches between the fields of ethnography and soundscape composition, this paper proposes to further the use of contextual information when making compositional decisions with sound materials derived from field recordings: a socio-sonic methodology. To begin the discussion, theoretical readings of sound in context are presented. 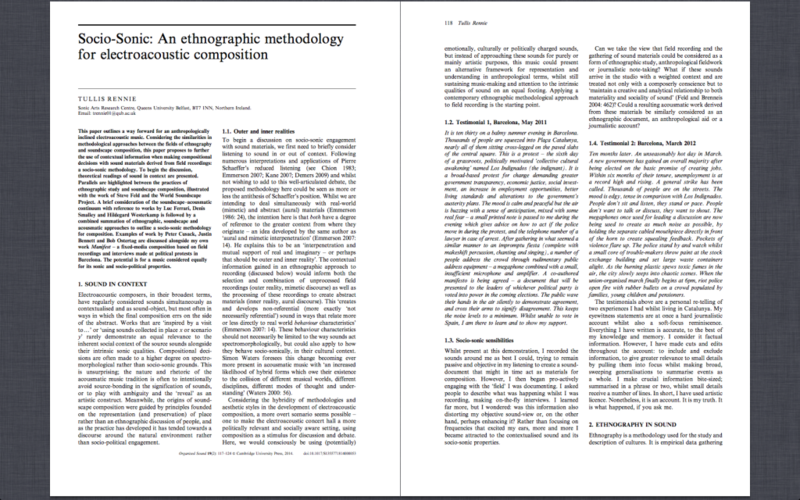 Parallels are highlighted between the practices of ethnographic study and soundscape composition, illustrated with the work of Steve Feld and the World Soundscape Project. A brief consideration of the soundscape–acousmatic continuum with reference to works by Luc Ferrari, Denis Smalley and Hildegard Westerkamp is followed by a combined summation of ethnographic, soundscape and acousmatic approaches to outline a socio-sonic methodology for composition. Examples of work by Peter Cusack, Justin Bennett and Bob Ostertag are discussed alongside my own work Manifest – a fixed-media composition based on field recordings and interviews made at political protests in Barcelona. The potential is for a music considered equally for its sonic and socio-political properties.